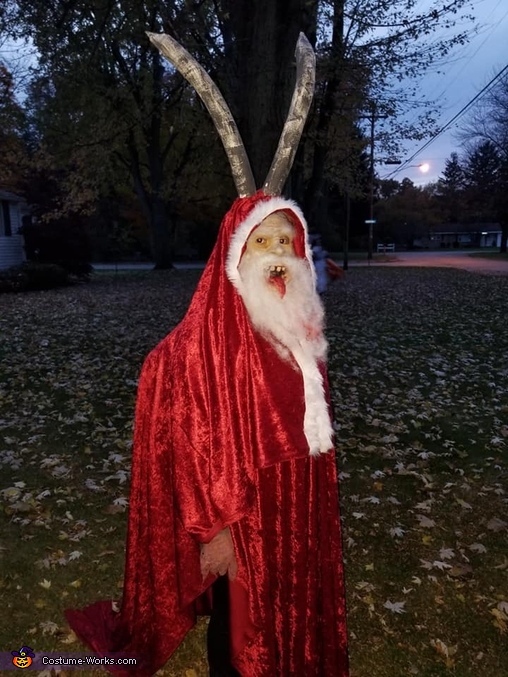 This homemade costume for kids entered our 2018 Halloween Costume Contest. This costume took me over 30 hours to complete. It took a lot of hard work, patience and care. We made a face cast of my face, then started molding clay onto the mask to make the face. Then I had to get all the finishing touches with the molding process and I started to put about 20 layers of latex. I also created teeth out of air dry clay and a tongue out of cotton and latex. My dad crafted the horns, I painted them. After all the latex was dry I had to paint and finish the mask. I painted it with sorts of gray, blue, and tan. then I colored the mouth with different shades of red and blue,( then put on scan blood). After the face was painted we used spirit gum ad an adhesive to glue on the facial hair. After that was all complete we started on the costume! My mother out together my costume. She used one very large pieces of fabric and cut a hole into one portion of it for my head. Then cut off one for my head so it looked like a cloak. After I glued the mask onto my face, covered the edges with latex and painted the rest of my face. I glued more hair onto the side f my face, and glued my teeth and tongue in. Then we finished off my costume with the clothes and the horns. Then there was Krampus. Many people loved it, a couple asked for photos. I got a lot of fun reactions and it was enjoyed my many. I scared some wich was amazing!